When 24-year-old Mikayla Springer thinks of her stepfather Brian Davis, she can’t help but see him being active. After all, when you spend time outdoors and like to do creative things like building an addition to the family home it tends to make an impression on youngsters. Now, it’s time for those touched by Davis’ influence in their life to be there for him. As many you may already know, last weekend Brian Davis was hurt on the job while working in Pennsylvania. And this was no minor injury. Davis was electrocuted. The scenario was so bad that Mikayla said they didn’t think Brian Davis would survive. Mikayla Springer said they got their initial miracle and she was quick to point out there have been a few more. She said the family is thankful for those miracles in a situation that, at times, has had to be trying on the collective souls of the entire family and their network of friends. Brian Davis has already dealt with surgery – multiple surgeries in fact. There will be more. Mikayla said he will lose (and likely already has) both of his legs from the knees down. 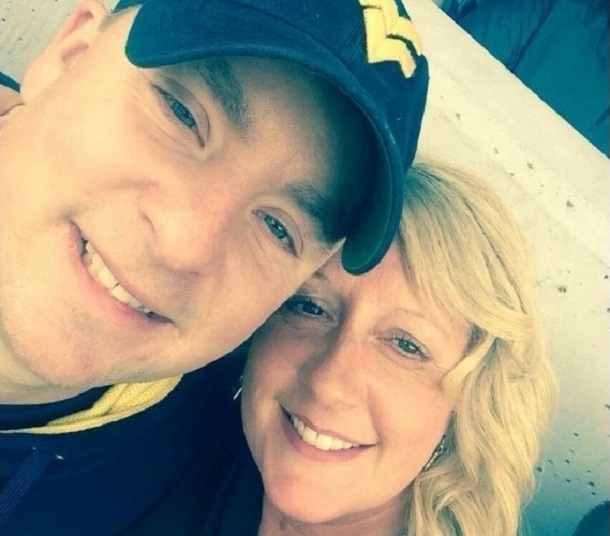 There will be at least another week in the intensive care unit up at the University of Pittsburgh Medical Center’s burn unit and perhaps a month or longer stay in the hospital. After that there will be rehabilitation. There will be a journey where the family will deal with pressures of a situation they never dreamed would happen. Yet Mikayla Springer, showing wisdom well beyond her 24 years, thinks more of what the family still has. First and foremost, they still have Brian Davis. And she had more. For those that know Brian Davis, she said this may be the most important. What has helped in the early part of this journey has been the support from the community. It’s come in various forms from financial assistant, to messages of every manner, prayers and offers of support as needed. “I’ve been blown away by it. It’s given us the strength to keep going at time to get so much love and support. It’s amazing to see our family and friends there,” said Mikayla. One of those family friends is Dreama Brazier. Brazier has been helping to spread the word about getting the community involved so Brian Davis and his family doesn’t have to go it alone. 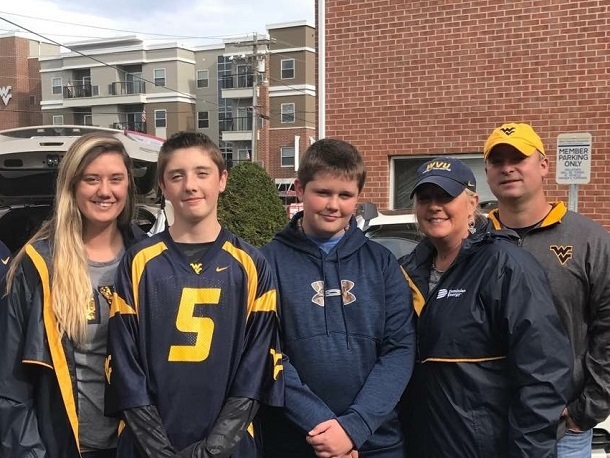 Brazier reached out to Connect-Bridgeport about the situation in hopes to spread the word in the city, Harrison County, West Virginia and beyond. It was what she felt she needed to do as a family friend. Brazier let us know about the gofundme.com page set up by Mikayla Springer. Regardless of the situation, whether health insurance is involved or not, there are costs involved that can’t be calculated or realized and simply won’t be covered by insurance. The goal is to raise funds to assist with those costs. The family unit in question here sees Brian Davis as the stepfather to three children. Along with Mikayla, there is 15-year-old Austin Springer (a student at Bridgeport High School), and 13-year-old Kyler (a student at Bridgeport Middle School). Right now, Jenny Davis has been staying with her husband. Family members, Mikayla said, have been going back and forth. Now it’s time for Bridgeport to make an impact and be positive as well. Visit the gofundme page linked above and do your part. If you are a person of faith pray. If you are not, the family I’m certain would appreciate good vibes and kindness. Brian Davis and his family need us now. Let’s not let them down. ADDED NOTE: Mikayla Springer also has announced that t-shirts (shown above) have been made and will be available this coming week to help raise funds. Anyone interested in purchasing a shirt shown here is asked to contact Jaclyn Belcastro. If you would like one delivered by mail, contact Jaclyn Belcastro or Mikayla Springer via messenger on Facebook. The delivery fees will be calculated upon inquiry. Those two can also answer any questions regarding the shirts. Adult and Youth sizes available! Also available at Bridgeport Family Pharmacy starting next week. 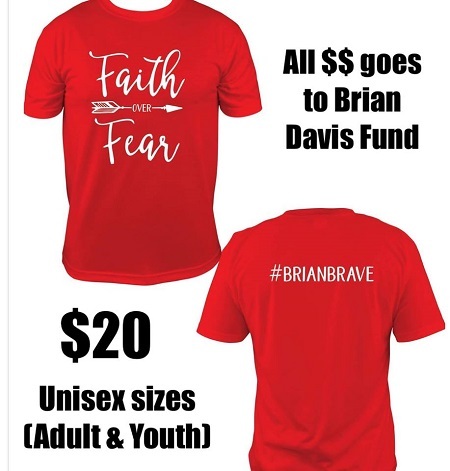 All proceeds go to the Brian Davis Fund. Payment can be made via PayPal (wvot4me@aol.com) or cash at delivery. Please write in the PayPal memo what size you would like.